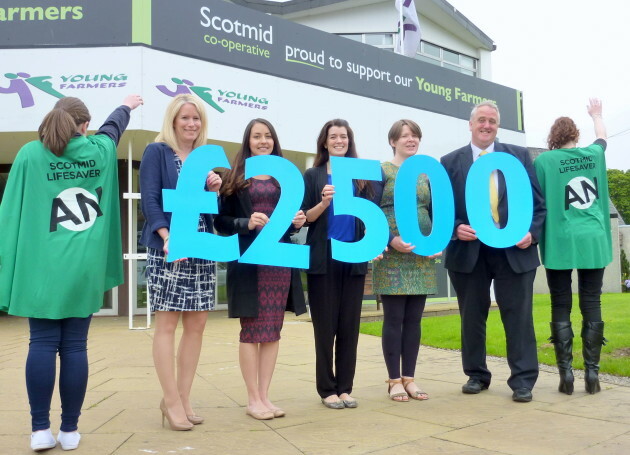 Scotmid Co-operative and the Scottish Association of Young Farmers Clubs (SAYFC) have joined forces to fundraise for Scotmid’s charity of the Year, Anthony Nolan. SAYFC hosted a Scotmid stall at the recent Royal Highland Show at Ingliston, where the convenience retailer invited visitors to ‘make their own’ homemade strawberry tarts in return for donations, with a total of £2500 being raised on behalf of the blood cancer charity. Penny Montgomerie, Chief Executive of SAYFC, said: “Charity and community is something very important to the Association and our members who raise thousands of pounds collectively each year. Scotmid and the SAYFC first formed a partnership in 2014 to help support rural Scotland – SAYFC offers a social networking opportunity for rural youths aged 14-30 throughout Scotland, providing personal development opportunities, while Scotmid supports Scottish producers putting money back into local economies. Joining SAYFC at the Royal Highland Show, staff from Scotmid were able to inform Young Farmers about the work of the Society and how young people can play their part in the Scottish food and drink sector. Scotmid also supported the ‘Ready, Steady, Country Cook’ competition and ‘Young Farmers Cook Off’, allowing competitors to use some of Scotland’s finest ingredients to produce their final dish. The partnership between Anthony Nolan and Scotmid Co-operative – including its brands Semichem, Lakes & Dales Co-operative and Scotmid Co-operative Funeral Directors – has seen more than 5,000 Scotmid staff at 350 stores transformed into the ‘Scotmid Lifesavers’ in a bid to raise funds and awareness for the charity. Anthony Nolan uses its donor register to match potential bone marrow donors to blood cancer patients in desperate need of a bone marrow transplant. At present, less than 60% of patients in need of a bone marrow transplant can find a perfect match. Find out more at www.anthonynolan.org/scotmid.